An Amish driver, horse and buggy travel on Forest Avenue in Fort Fairfield in September 2011. 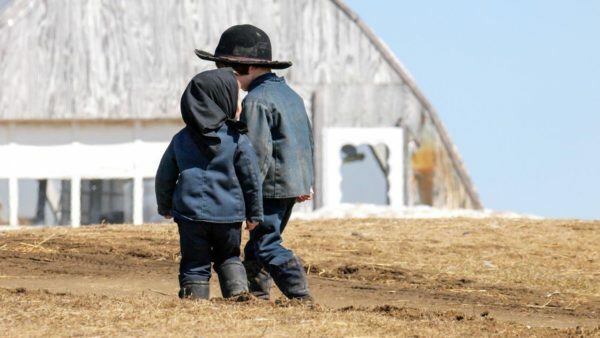 Two Amish children walk along on a farm in Fort Fairfield in April 2009. 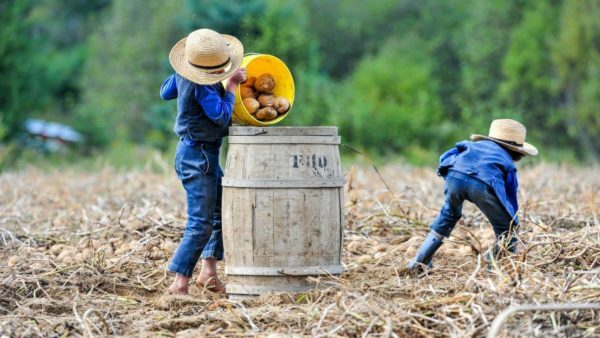 Two Amish youngsters pick potatoes on a farm in Fort Fairfield in September 2010. 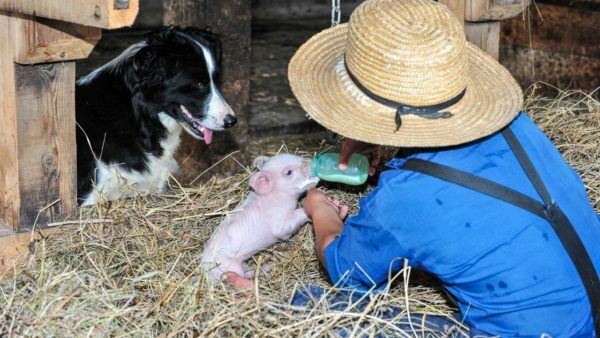 An Amish youngster feeds milk from a bottle to a baby pig while under the watchful eye of his pet dog in Fort Fairfield in September 2010. Amish workers gather hay on a farm in Fort Fairfield in September 2016. The former Johnson farm on Forest Avenue in Fort Fairfield is now the homestead and farm of the Yoders, one of more than 30 Amish families who have settled in Easton, Fort Fairfield and Presque Isle. August 2017 marks a decade since the Yoders and other Amish families settled in central Aroostook County. 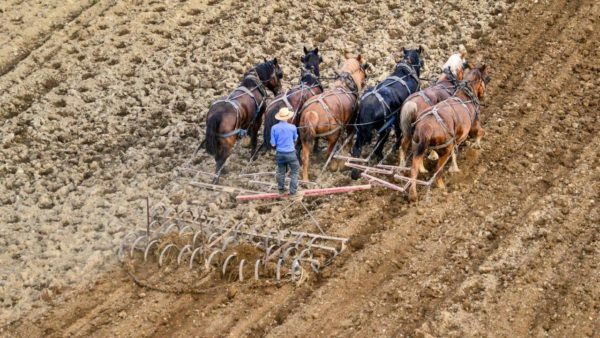 An Amish farmer and his team of six horses prepare a field for planting in Fort Fairfield in May 2015. FORT FAIRFIELD — When Noah and Lovina Yoder and their 11 children moved onto the former Johnson farm on Forest Avenue in Fort Fairfield, they planted plums from a tree Noah Yoder’s father originally grew in Ohio. Noah and Lovina Yoder, both now 49, had already moved once when they were younger, from Ohio to the St. Lawrence Valley of New York, and with upstate New York filling up with other Amish in the mid-2000s, they were ready to move again. “Being more of a pioneer, I decided to branch out someplace else, and Maine always interested me,” Noah Yoder said Aug. 1 from his watch and clock workshop, located across the yard from the now-thriving plum and other fruit trees. When the Yoders moved here in August 2007, they were the first of more than 30 families that would settle around Easton, Fort Fairfield and Presque Isle. Yoder said he didn’t actively recruit any others, but four other Amish families from the same region of New York followed and settled in Easton and Fort Fairfield the following year. In the subsequent years, Amish around the country followed the Aroostook settlement’s progress in Die Botschaft, an Amish weekly newspaper distributed by mail. Soon other families from Iowa, Kentucky, Missouri and elsewhere struck out for central Aroostook County. 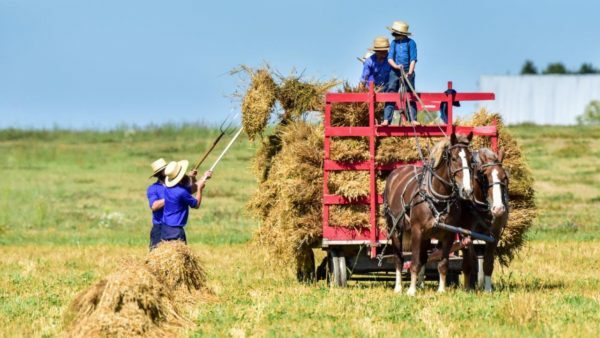 The Amish families have since developed a symbiotic relationship with local communities as they’ve found a range of business opportunities and ways to collaborate. The Yoders suffered a family tragedy in February 2013 when their oldest son, Roman, died in a car crash during a snowstorm. Riding as a passenger in an SUV with a neighbor, 22-year-old Roman and the driver crashed into a snowplow on Conant Road in Presque Isle before being rear-ended by a logging truck. While they still grieve over the loss of their son, the Yoders found support from Amish and non-Amish alike and have continued their work as pioneers. 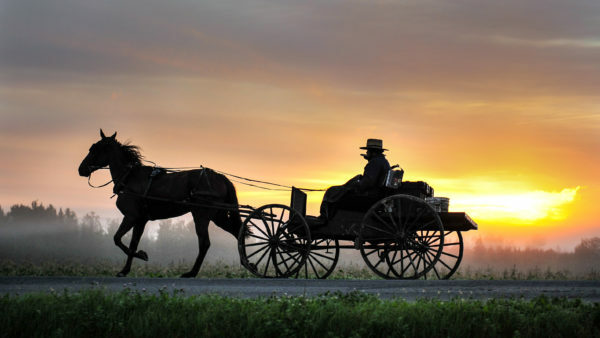 The Amish originated from the Christian Anabaptist movement and practice simple-living traditions, avoiding many aspects of modern society such as electricity, motor vehicles and telephones. Most Amish light their homes with oil lamps — the Yoders use mineral oil — and dress in plain clothes, with women often wearing bonnets and men hats. Central Aroostook County’s Amish belong to the more traditionalist Old Order fellowship, holding church service in one another’s homes and speaking with one another in a mix of German and Pennsylvania Dutch. Maine’s first Amish settlers were families from Tennessee who came to Smyrna in 1996 and later branched out to Hodgdon and Unity. Yoder said he was looking for a rural area, but one with a nearby population center and stores with supplies as well as potential customers. 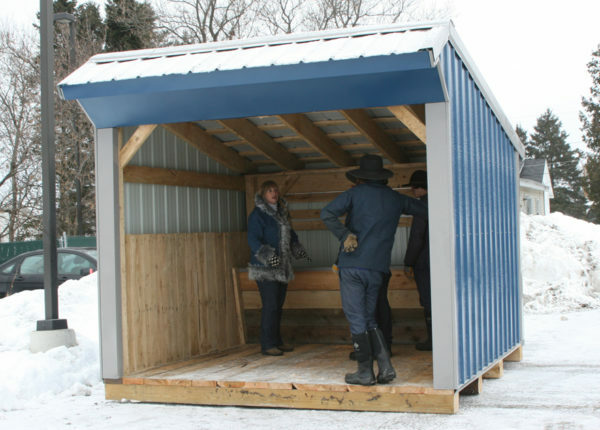 In Presque Isle these days, it’s not uncommon to see Amish families shopping at Marden’s, Wal-Mart or Lowe’s, or to see teams of Amish roofing crews installing metal roofs on older houses. After arriving in Fort Fairfield, the Yoders ran a small dairy farm, as they had in New York, selling to the New England milk company Agri-Mark, and opened a small bakery and farm stand. But like other entrepreneurs, they try to keep evolving their enterprises. Last October, they sold their dairy herd and turned their focus to running a small sawmill and making pallet wood for County Box and Pallets, which supplies the McCain Foods potato processing plant in Easton. “That business was growing so that we no longer had the time to take care of the cows,” Yoder said, explaining how they work with local loggers to buy timber. Yoder’s son Daniel also operates a wooden furniture business. Other local Amish businesses include bakeries and farms, J&J Mini Barns, Miller Metals, metal roofing installers and certified organic dairy farms selling to the Organic Valley cooperative. Several of those farms are operated by more recent central Aroostook Amish settlers in the town of Perham, west of Caribou. Noah Yoder and his family spend the summer working their sawmill and vegetable farm, and he spends much of the winter on clock and watch repair. The Yoders and other Amish businesses with machinery, including Millers Metals, use diesel engines that power a line shaft and belt. Their businesses also are dependent on a host of non-Amish businesses and modern technology, including truckers who bring raw materials and the finished product. In these and other aspects of life, the Amish have made decisions to accept somes changes from the modern world while still following tradition, Yoder said. In central Aroostook County, the Amish will occasionally ask neighbors for a ride somewhere or hire a taxi or take a bus, but they won’t drive themselves. In the case of diesel-powered sawmills, Yoder said Amish have been using small, non-electric engines and line shaft and belt systems for well more than a century. As one of the Amish leaders who confers with local government officials, Yoder said the Amish families have felt and continue to feel welcome in the area and count many non-Amish among their friends, customers and business associates. At the same time, they’ve encountered some growing pains, including complaints about horse manure in roadways as well as a dispute with the town of Easton over a 2015 property revaluation that raised the taxes on recently built Amish barns. 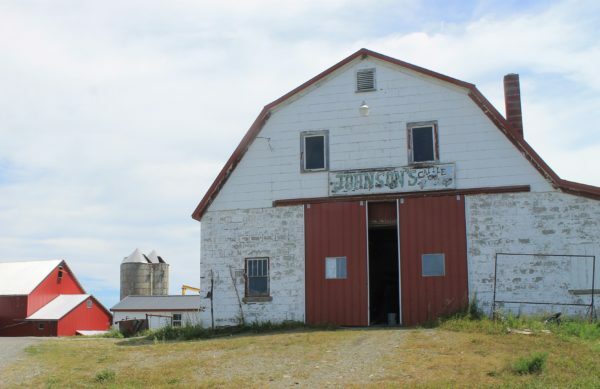 The commissioners agreed with the families and granted them abatements that reduced the town’s assessments on the barns by about 25 percent, but the town of Easton appealed to the Aroostook County Superior Court, which in January ruled in the town’s favor and overturned the abatements. The Amish families have agreed to go along with the tax assessments, but it has still left some concern about the property valuation process among the local Amish community, Yoder said. “There really is something wrong with the way they’re doing the numbers on the barns. They just don’t have the values that they’re putting on them,” he said. Nonetheless, Yoder sees a bright future for his and other Amish families in Aroostook County, despite the continuing decline in northern Maine’s population. The Amish are one of the few demographic groups that are growing in ranks in northern Maine. According to a recent informal population survey by the Northern Maine Development Commission, there are more than 400 Amish living in Aroostook County, spanning communities from southern to north-central Aroostook. Many locals also are happy that the Yoders and other Amish families came to central Aroostook, according to Phil Christensen of Fort Fairfield, who lives near several Amish families and recently sold two of them some parcels of land. Christensen left Fort Fairfield for a career with the U.S. Department of Agriculture and returned to his hometown in 1999 — a difficult economic period for the region after the closure of Loring Air Force Base. At the USDA, Christensen worked with Amish farmers in states such as Illinois and Pennsylvania, and didn’t expect to see them in The County. Along with starting new businesses and adding to the tax base, the Amish have helped bring diversified farming back to Aroostook County and put long-fallow, small fields back into production, Christensen said.